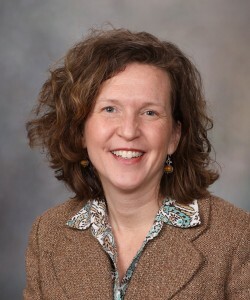 The research program of Celine M. Vachon, Ph.D., has focused on cancer and in particular, genetic epidemiology to understand cancer through investigating early markers on the carcinogenic pathway, including mammographic density and benign breast disease in context of breast cancer and monoclonal gammopathies of undetermined significance (MGUS) in context of multiple myeloma. Over the past few years, with recognition of the importance of subtypes of breast cancer, Dr. Vachon has been actively researching differences in breast cancer etiology by subtype, including establishing a multi-site R01 to examine the association of mammographic density and subtypes, and co-leading an international consortium (in collaboration with Dr. Fergus Couch), the Triple Negative Breast Cancer Consortium or TNBCC, focused on the genetic epidemiology of triple negative breast cancer. Dr. Vachon has established a mammography cohort in the Mountain Park Clinic in Arizona to better understand breast cancer risk and outcomes in Hispanic women.